Introduction. The e-book and its associated technology have emerged as a disruptive technology over the past ten years. The aim of this paper is to discuss some of the consequences of this development, based on the work of the e-books in Sweden research project. Argument. To explain the impact of the e-book phenomenon we use Winston’s theory of technological innovation, with particular reference to the ‘supervening social necessity’, the combination of factors that turns an innovation into a marketable product. As a result of the technology all aspects of the production, distribution and use of books is affected. Sectoral and cultural variation. The e-book is having different effects in different sectors and in different parts of the world: rapid development in the USA, slower in France and Japan; rapid development in academic libraries, slower development in public libraries, from country to country. These differences suggest that more than one supervening social necessity may be needed to explain the divergencies. Conclusion. There is a great deal of exaggeration of the impact of the e-book, based mainly on its influence in the USA. Development in other countries is taking place more slowly and differently and in ‘small language’ countries like Sweden, the pace of development, except in academic libraries is likely to be slow. The emergence of the e-book as a major phenomenon in the publishing industry is of interest, world-wide. The English language market, with Amazon.com as the major player in the market may have dominated attention, but the e-book has implications for many other languages and book markets. The statistics are compelling, but the scale of things should not be exaggerated: for example, in May this year the BookStats report noted that the sale of e-books had increased by 45% since 2011 - 457 million e-books were sold in 2012, but that is 100 million fewer than the number of hardback, print books sold (Book Industry Study Group, 2013). Similarly, in the UK, in 2012, e-book sales were 89% higher than in 2011, totalling £145 million, but physical book sales totalled £982 million, i.e., almost seven times as much. In other countries the percentage increase in e-book sales is much lower: e.g., 3% in France and 2.4% in Germany. In the case of France, certainly, one factor is the number of devices in circulation capable of reading e-books: in the USA some 34% of the population own a tablet computer, whereas in France it is about 10%; in the USA 56% of the population have a smartphone, while in France it is a little over 31%; in the USA 25% own an e-reader, in France it is about 1% (Wischenbart et al., 2013). The pre-e-book publishing world can be seen as a system in which authors delivered texts to publishers, who evaluated, edited, printed and distributed the published text to bookshops and thence to libraries and individual readers. This process has been going on since Gutenberg’s re-invention of movable type in about 1439, in other words, for about the past 450 years. The invention of movable type was an instance of a disruptive technology: eventually putting monastic scribes out of business altogether: in the fifty years after the invention, some eight million books were printed (Williams, 1957, p. 377). Similarly, the e-book has the potential to disrupt the processes for the production, distribution and use of authorial texts, and is already in the process of doing so, rather more rapidly than did the printing press. The purpose of this paper is to outline the emergence of the e-book and its associated technology as a disruptive technology, to discuss how this disruption may affect different sectors and different markets, and to describe an ongoing research project on the role of the e-book in Sweden. In the e-book project, financed by the Swedish Research Council (Vetenskapsrådet), we intend to study the impact of the e-book on the complete creation–production–distribution–use process, from authorship through publishing, bookselling, to libraries and buyers and readers. The basis of technological innovation is scientific understanding of some phenomenon. In the process of innovation, scientific ideas become the basis of technological developments through a process of ideation [that is, someone must have an idea of how to develop the science into application]. A variety of prototypes is likely to emerge as technological development takes place. A supervening social necessity determines which prototype succeeds as the accepted innovation. At some point a prototype (or prototypes) becomes accepted as an invention, at which point it enters the marketplace. Several branches of science underly the development of the e-book and the reading devices associated with it: computer science, screen display technology, materials science in the development of components, and so on. All of these relate to the development of the computer and its ultimate reduction in size to the e-reader such as Amazon’s Kindle. Electronic books, from sources such as Project Gutenberg were being read on desktop computers and laptops for some years before someone had the idea of the dedicated e-book reader. However, the notion of a personal, portable device for reading books actually goes back to 1930, when Bob Brown suggested a device, based on miniature microfilm, which would be 'A simple reading machine which I can carry or move around, attach to any old electric light plug and read hundred-thousand-word novels in 10 minutes if I want to, and I want to' (Brown, 1930, p. 28). The machine does not appear to have been built, and it is doubtful whether the existing technology would have been adequate, but the ideation was there. The reality of the e-book reader had to await the development of computers and all the associated technologies and in 1998, the first e-readers were produced: these were the Rocket E-book and the SoftBook Reader (Lebert, 2011). Interestingly, the investors behind both of these were the bookseller Barnes & Noble and the German media giant Bertelsmann for the Rocket and publishers Random House and Simon and Schuster for the SoftBook. We may have the impression, given the way developments have taken place in recent years that publishers have lagged behind the technology, but these facts suggest otherwise. Clearly, publishers realised that, if the e-book was going to be a marketable product, they wanted to be in at the beginning of the market. We see the supervening social necessity as the key concept in Winston’s theory, since this factor is proposed to determine the accepted innovation. By supervening social necessity Winston means the coalescing of various social and technological forces that turn the innovation into a practical reality. We can perhaps see this in the emergence of those early e-book readers: here, the technology was at a stage when various prototypes could be produced and publishers, alert (as companies need to be) to threats and opportunities were instrumental in fostering thate new technology. However, there was no immediate uptake of the devices–at this point it seems that only the early adopters (Rogers, 2003) were inclined to buy e-readers and read e-books. Gemstar, the company that bought both Rocket and SoftBook (and went on to produce more) went out of business in 2006. However, the concept of supervening social necessity is rather vaguely defined by Winston and, as a result of the research, we may be able to identify more clearly the kind of factors that constitute the concept for different sectoral interests. Winston's theory is not the only framework of use in the project: Rogers's theory of technological innovation (2003) has already been referred to as relating to the pace at which the take-up of the e-book may have been affected by the adoption of devices upon which they can be read and, as that varies from country to country, so early adoption may take place much later in one country than in another. The technology acceptance model (Davis, 1989), which integrates the usefulness and ease of use of technology is also relevant and these concepts may be explored in our study of the users (and non-users) of e-books. An extension of the this model, the unified theory of acceptance and use of technology (Venkatesh, Morris, Davis and Davis, 2003), brings into play ideas such as the social influences on the adopter and, although the theory was developed for technology use in organizations, aspects such as social influence may also be relevant in the world of the 'ordinary reader'. We anticipate that by being hospitable to various theories of technology adoption and use, we may be able to contribute further to these theories. 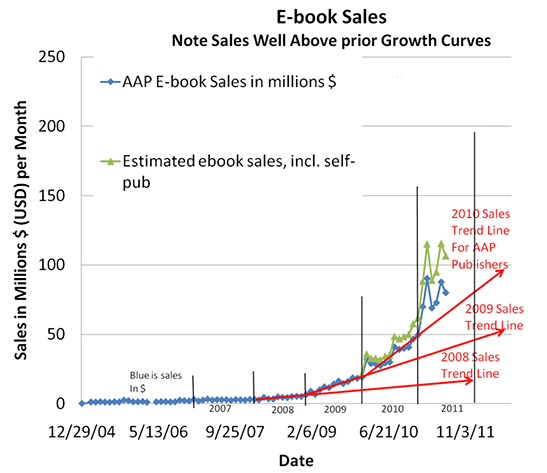 However, 2006 was the year when the growth of e-book sales actually began, as Figure 1 shows. There were probably a number of reasons for this, for example, the first Sony e-reader was produced in that year (meeting with varied critical response (e.g., Young, 2006), but probably the main reason was that the personal digital assistant or PDA (now largely forgotten as its functions were taken over by mobile phones) and Apple’s iPod (first produced in 2001) were able to read e-books and the early adopters of e-books were using these as reading devices. Palm was probably the dominant PDA manufacturer at the time (it too is now dead) and the company set up e-reader.com to sell e-books and, in 2006, that venture was said to be thriving. However, Palm discontinued production of devices in 2008 and its intellectual property was sold to Hewlett Packard in 2010. The book store was taken over by Fictionwise.com and continued to sell e-books until December, 2012. Fictionwise had been bought by the bookseller, Barnes & Noble, in 2009 and, presumably, the company wished to integrate the Fictionwise activity into its own Nook bookstore. Sony had tried to combine an e-book sales site, ebookstore.sony.com, with the production and sale of its eReader. The problem the company faced was that of engaging with publishers and persuading them to collaborate, although it did have deals with a number of the major publishers. Also, it sold well only outside of the USA. Amazon, on the other hand, already had arrangements with publishers and it was easier to persuade them to produce e-books because the Kindle reader had an acceptable variety of DRM. They also arranged a pricing deal so that the publishers got as much from an e-book sale as they did from a physical book sale. With the arrival of Amazon and the Kindle on the scene, therefore, the available content began to grow rapidly and the e-book became a readily-available alternative to the print book. 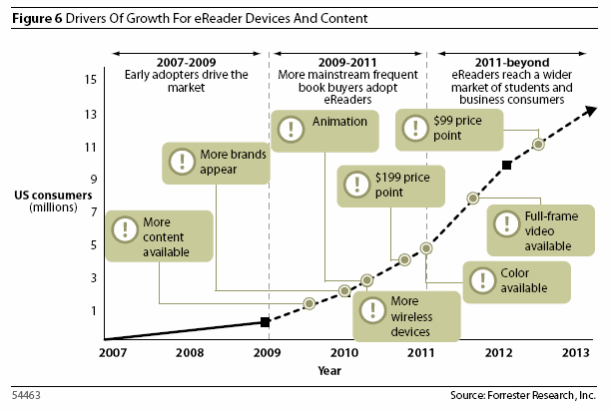 Figure 2 shows the growth in the sale of e-reader devices and content, within the Rogers’s framework of early adopters, mainstream buyers, etc. At this stage of the project, it is rather too early to be predicting the outcome in terms of how we define the supervening social necessity, but, if we consider the idea of a number of forces coalescing at a particular point in time to provide the driving force for the sale of e-books, we can say, that in 2009, devices were available, content was becoming more readily available, publishers were getting on board in increasing numbers, and people were buying e-readers in larger numbers: the technology was becoming mainstream. Then, in April 2010, another major driver appeared on the scene - the Apple iPad. This was the first tablet computer actually to take-off as a major market phenomenon: in 2010 more than 14 million items were sold, which seems a very big number, but by October 2011 the total was 32 million, at the end of 2012 it was 84 million and by October 2013 it has grown to in excess of 170 million - with the release of the iPad Air, it may have exceeded 200 million by the end of 2013 (Costello, 2013). Apple not only has customers, it has a fan-base: people who buy a product simply because it is a new Apple product, and I suspect that it is the only technology company that can be described in those terms. It is not surprising, then that sales of e-books took a further upward turn in 2011. Another factor, both for producers and consumers is finance: the devices became cheaper over time, e.g., Sony’s e-Reader was $350 in 2006, today it is at least $100 less; the first Kindle was also $350, today you can buy one version for $69. From the publishers’ point of view, e-books simplify the production process, have negligible distribution costs and return about the same profit percentage as print books, and from the reader’s point of view, overall, e-books are cheaper than print books, they are more portable, and many are freely available. It has also been noted that it is less easy to see what one is reading, when you are sitting in the subway train on the way to work (Smith, 2013). In other words, coming together, we have appropriate technology, appropriate content, economic viability, and user convenience: a pretty unbeatable combination, and, to a degree, unexpected, since before the Kindle and the iPad emerged, e-books were not expected to become a significant part of the book market. 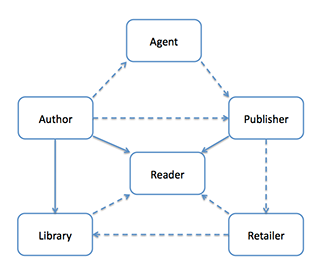 Figure 3 shows a much simplified representation of the inter-relationships among the various players in the book market: an author creates a text, and possibly uses an agent to find a publisher, or does so independently. The publisher employs book designers to determine type styles, layouts and cover illustrations (possibly outsourcing these functions). The book is printed (either outsourced to a printer or undertaken in-house) and distributed, making use of distribution services, or public facilities such as the mail. Ancillary services such as marketing and publicity are employed, again, either in-house or outsourced, to present the book to the intended audience. The main retailers are the bookshops, although supermarkets and online suppliers are increasingly important, and libraries of all kinds obtain their books either through booksellers, or directly from the publisher, or from some book supply agency. The figure simplifies things somewhat (and there are many, more complex models of the process) since roles such as editor, copy-editor and proof-reader are also involved in the process, but it does identify the main players. We can see that in the present system, the publisher is at the centre of things, receiving manuscripts, deciding to publish, setting up design, printing, distribution, marketing, etc., etc. How, then, is the development of the e-book going to disrupt this process, if it is, indeed, a disruptive technology. Before doing so, however, it is necessary to define what we mean by disruptive technology. Christensen (1997) notes that the products of a disruptive technology tend to be simpler and cheaper than the established equivalent, they offer lower marginal profits and emerge initially in emerging or insignificant markets. ‘By and large a disruptive technology is initially embraced by the least profitable customers in a market’ (Christensen, 1997, p. xvii). For all of these reasons established companies rarely invest in such technologies, since they are unlikely to satisfy the company’s requirements of increased profitability and growth. For that reason, the products tend to be developed, promoted and marketed by new entrants to the industry. The e-book would appear to fit this description: it is easier to produce and distribute an e-book than it is a printed book; they are priced lower and, initially, may offer lower marginal profits; in the beginning they emerged as free products through sites such as Project Gutenberg, known to a minority of consumers who were not likely to be playing a major role in the established publishers’ profits. We also see new entrants in the e-book business: computer companies such as Apple with its iBook Author software and iBookstore products, producers of e-book readers such as the publisher Barnes and Noble and the online bookseller, Amazon.com, along with new entrants such as Smashwords, taking on the role of publisher and distributor. On these indicators, e-books are definitely a disruptive technology. the number of self-published titles in 2012 jumped to more than 391,000, up 59 percent over 2011 and 422 percent over 2007. Ebooks continue to gain on print, comprising 40 percent of the ISBNs that were self-published in 2012, up from just 11 percent in 2007. Here we see that disruption is not a word signifying destruction but that it has potentially beneficial consequence where new businesses are created. Smashwords (https://www.smashwords.com/) is one such business: it provides services to authors, including the conversion of files to most e-book formats and distribution of the finished books to appropriate outlets, including Amazon. According to the Bowker report, Smashwords, which was launched in 2008, is now the biggest provider of e-books in the USA, having published more than 90,000 e-books in 2012. Both EBSCO and ebrary now have subscription-based academic collections with hundreds of thousands of titles. The licensing of these titles kills both print and e-book sales. Most contracts with publishers do not mention licensing and royalties are only paid on sales (and usually only after a certain threshold). He goes on to comment that a book of his, published in December 2012, has appeared in 'several hundred' library catalogues as a result of the accessibility of licenses e-books but that 'Since March 2013 print and e-book sales of this monograph have evaporated'. Clearly, unless author’s contracts include reimbursement from big deal licence income, the future of the scholarly monograph is under threat. The success of Smashwords and, in the printed book world, CreateSpace, and the growth of self-publishing means that the traditional publisher is now faced with a new competitor. So-called vanity publishing (where one pays to have a book published) has been around for a long time, but without much of an impact on publishers. This new development of e-books, however, has a positive side for publishers; they may derive significant economic benefit from the reduction in printing and distribution costs, as well as the ability to sell directly to the consumer through their own Websites. Although self-publishers and the related service companies may constitute a threat, the fact that the market decides whether or not a self-published author is successful means that the traditional publisher can step in and offer print publication for future books and even for the existing output. In the world of scientific, technical and medical publishing, it seems that publishers such as Elesevier and Springer have already seized upon e-publishing as the way of the future. For companies such as these with their experience of publishing e-journals, the transition to e-books must have been an obvious one. While holding on to ownership of nearly 80 percent of its Nook division, a $300 million investment in Nook from Microsoft last fall, followed by an $89.5 million commitment from Pearson, which sees value in the growing electronic textbook market, are signs that Barnes & Noble can forge a way to secure enough of the digital business to offset the problems it faces in traditional bookselling. In other words, perhaps disruption can lead to increased innovation. Indeed, it seems that innovation will be absolutely necessary if bookshops are to survive the disruption. In the case of libraries, user demand is raising the problems of how to manage e-books within their collection development and management processes, as well as how to negotiate with publishers on price and other aspects. The situation varies among the different types of library and information service. In Sweden, for example, many university libraries already spend more on e-resources than on print materials, and university librarians expect the proportion to grow. The greater proportion of e-books in university libraries are in the English language, especially in science, technology and medicine, since this is the language of international scholarship in these fields. The problem of the small language country, therefore does not apply in this case. For public libraries in Sweden, the situation is very different: although the proportion of e-books borrowed is still quite small, it is growing rapidly and, because the library must pay the publisher SEK20 for each loan, there are significant budgetary issues to deal with. There are also professional issues, since the librarians complain that the provider (Elib, a consortium of the four largest publishers in Sweden) makes arbitrary decisions about what is made available, when it is available and when it may be withdrawn, their ability to carry out a professionally informed selection process for their readers is inhibited. Finally, although there are other business sectors, such as the printing industry and transportation services that may be adversely affected if e-book production comes to rival or even exceed printed book production, we turn to the consumers of book production, the readers. The behaviour of readers is changing as the devices available for using e-books become more numerous and cheaper and a variety of factors seem to drive the adoption of e-books, probably associated differently for different kinds of readers and different kinds of books. When the users of e-books are questioned about their reasons for adopting e-books, the advantages of convenience and portability are cited. 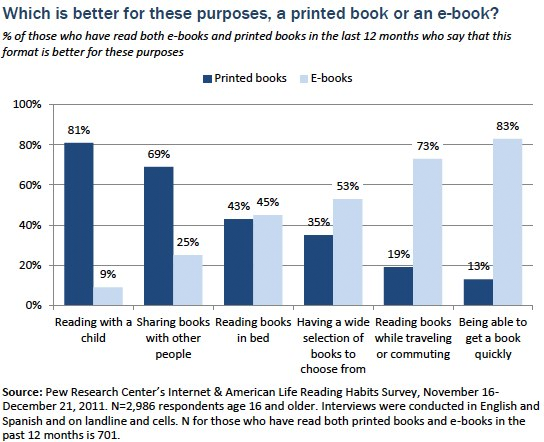 For example, Figure 4, above, shows the responses to a question on the preferences for printed books and e-books in a study of readers in the USA. The e-book clearly scores over the printed book in three areas: having a wide selection of books from which to choose (in that the device may hold an entire library and, with wi-fi or mobile phone connection, all of Amazon’s e-books are also available), reading while travelling, and being able to get a book quickly. These three areas may be summarised as convenience and the exigencies of modern life – commuting to and from the work-place and time pressure that prevents visits to libraries or bookshops – make these factors important to the average reader. Figure 5 shows the situation that may result from the disruption of , with the dotted lines indicating links that may be less significant in the future than they are now. The figure suggests that the publisher may have a less central role in the future than has been the case in the past, and that there may a power shift to the author, who can do much more independently of the publisher than ever before. 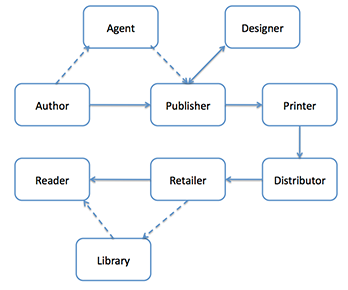 Some lines have been omitted, of course, to make the diagram more readily readable: it is evident, for example, that the publisher may sell directly to libraries and that authors may sell directly to booksellers. Already we see signs of the power shift; for example, an author like Cory Doctorow can make available DRM-free books, through his own Website. Not only available directly to the reader, but freely available, with the agreement of the publisher – with a request that if the reader likes the book, they should buy a copy for someone else or for a library or a school. The diagram also hints at which agencies may be most at risk: clearly, with lower prices for e-books, and direct distribution from authors’ Websites and publishers, the role of libraries and booksellers may become less significant. I have noted already that independent booksellers are disappearing in the USA and the UK as a result of online bookselling and if the proportion of e-books sold continues to increase, the effect is going to be even more obvious. The libraries most likely to be affected are public libraries, particularly if they are unable to negotiate more economic deals with publishers. The most obvious change, however, is that the reader has more options than ever before, being able to buy directly from the author, from the publisher or from the bookseller, or to borrow from a library. Ultimately, it is the choices that readers make among these options that will determine the future outcome. Discussions of the e-book generally take place in the context of the general reading public; which is not surprising, given the dominance of Amazon in the marketplace. However, there are other sectors in which the e-book may have an impact and may be equally disrupting. These sectors include children and the use of e-books in school and at home; secondary school and university students, business, and government. Business and government have been producing e-books for many years, in the guise of pdf files of reports, but many e-books are in the form of pdf files, so there is no real difference. Today, however, systems are coming on to the market that enable the e-book to take a new form, with built-in video, animation and interactive possibilities. One can envisage a user manual for a product, for example, taking the form of a very interactive e-book, with animations and explanatory video clips. For example, watching someone put together an IKEA self-assembly product, such as an office desk, is likely to be much more useful than reading rather enigmatic instructions or following the intentions of even more enigmatic diagrams. For government, too, the potential to present policy much more effectively through animation, audio and video must be irresistible. It will cost more to produce such e-books, of course, and we may see the emergence of an entirely new profession of e-book director, i.e., someone who brings all elements of the book together in a planned and effective manner. Entirely produced by Irish authors, designers and developers, these e-books can help create a more interactive learning environment with videos, e-tests, animations and podcasts. Students can take notes, highlight and search text, and create bookmarks, enabling them to personalise their educational resources as they progress through the exam cycle (Burke, 2012). but one suspects that the economic argument will prevail in the long run. Support from this view comes from a Bill recently introduced into the US Congress calling for the funding of open textbooks for use in schools and colleges, which notes that the cost saving could be between 80% and 100% (Durban… 2013). Given that a chemistry textbook can cost in excess of $200, it is easy to see the savings. Students, however, appear to be not quite as enthusiastic about the use of e-textbooks; for example, in a survey of 1,652 students in a Texas college revealed that 80% preferred the traditional textbook, a finding that was ignored by the college administrators, who implemented a standard set of e-textbooks (Rodriguez, 2014). those who had diminished VA [visual attention] Span scores were able to comprehend better when reading on the iPod than on paper. Likewise, considering reading speed, those who had poor phoneme decoding skills, or those with poor sight word reading skills (significant for Level 7only) read faster using the iPod than reading on paper (Schneps et al., 2013: Discussion, para. 1). If the work is repeated with younger children with the same results, the management of dyslexia may be improved. Much of the hype and information about the extent of e-book use and e-reader sales relates to the USA, with a smaller amount from the UK. Consequently, what is happening in other cultures is not so well known. Certain countries are sufficiently large to be able to maintain a cultural difference and, in some cases, there is actual policy to support this position. France is probably the best example of a country determined to resist 'Americanisation', although its success in this varies. France also has the advantage of being a world language, although on a smaller scale than English, with approximately 200 million first- or second-language speakers around the world. France seems to have been slow to embrace the e-book, which may result from the higher VAT applied and also to the fact that book prices are fixed in France. A recent report (KPMG, 2014) notes that 62.5% of French publishers have produced e-books, a relatively low proportion (given the global audience), which supports the idea that VAT and book prices are a deterrent in the marketplace. Further evidence is found in a global study by Bowker, which revealed that France and Japan have the lowest take-up of e-books, with 66% of French people saying that they had never read an e-book and did not intend to do so (Greenfield, 2012). 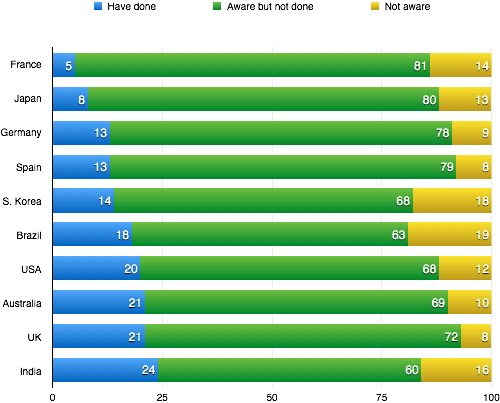 The country data from the Bowker study are shown in Figure 8. Germany, too, appears to have the possibility of resisting the impact of Amazon: Libreka! is the joint e-book publishing platform of German publishers and booksellers and it is anticipated that e-books will occupy about 6% of the market by 2015. Libreka! managed 78,000 e-books in 2011, but in that year, Amazon moved into the market with a total of 650,000 e-books, including 25,000 in German (Indvik, 2011). Currently (April, 2014) Libreka!, which also features printed books, advertises that 1,012,456 e-books are available: clearly, there has been significant development in only two years. On the other hand, in Japan the impact of the e-book is reported to be relatively low and a number of circumstances appear to influence this situation: first, an alternative technology, the mobile phone became successful as a device on which to read books, particularly Japanese comic books; secondly, there are more bookshops in Japan (almost 15,000 in 2012) than there are in the entire USA (just over 12,000 in 2012); and, finally, books are not only more readily accessible, they are also relatively cheap (Nagata, 2013). This suggests that the supervening social necessity has not yet emerged in Japan to stimulate growth in the e-book market–and perhaps it never will. Smaller, small language countries are in a more problematical situation: we can consider them under two headings; those in the developed world and those in the developing world. In the developed world, all small languages have, by definition, small book markets in general and, given the relatively small proportion of people globally who have a device on which to read e-books, it is likely that the e-book market is a small fraction of the total book market. Also, the more literate the society, the wider the spread of English language competence, the more exposed the country is to invasion from English language book producers (which are not all based in the USA or the UK). In the developing world the situation is even more complex: literacy levels tend to be low, while the disposable incomes of the majority of families will rarely allow the purchase of either e-books or, more significantly, the devices on which to read them. True, the mobile phone has made a significant impact in many African countries (Africa…, 2011) and, globally, 50% of mobile phones sold are smartphones, capable of reading e-books. In addition, there are various programmes employing e-books and the associated readers in schools in the developing world, for example, Fowler and Bariyo (2012) reported on such schemes in Africa, noting the use of the Kindle device, the Worldreader programme. and the One Laptop Per Child programme. If these developments are continued into higher education and into everyday life, the developing world market will be enormous. The crucial issue, however, is whether or not suppliers of e-books in the local languages (some of which are spoken by very small populations) will emerge, or whether the English e-book provider will dominate. Only someone blessed with absolute certainty in forecasting the future can know exactly how things will change, but there is little doubt that the development of the e-book will bring about substantial changes in the processes of book production, distribution and use – and many of these changes will surprise us. Many questions will be resolved in coming years, such as: Will self-publishing of e-books continue to grow? Will universities enter the open access textbook market? How will publishers integrate their systems for the simultaneous publication of printed books and e-books? In small language countries what systems of collaboration among publishers and booksellers will evolve? Which categories of books are likely to exist only in e-book form? How will bookshops respond to the challenge of the e-book? Will online e-book selling dominate the book market? And many more. The present state of things is also somewhat unclear: we know a good deal about the situation in the USA, mainly because of the surveys undertaken by the Pew Research Center, but details of the situation in the rest of the world are rather hard to come by. If we can generalise, however meagre the evidence, we do see a significant increase in the publication of books in electronic form; we do see in many countries a decline in the number of bookshops, a reduction in the number of library loans and, in some countries, concern expressed at the decline in reading. It may be that the e-book will actually turn around some of these factors; for example, the Kids & Family Reading Report (Scholastic… 2013) notes a 14 year-old girl saying, 'I read more because I have an ereader' and a 16 year-old boy, 'I would like to get an ebook reader so I will want to read more books'. If a working relationship that benefits both sides can be evolved, we may see publishers and libraries working together to increase the number of library loans and perhaps more loans will be e-book loans. Perhaps, too, bookshops may evolve into more diverse community-serving agencies and there have been calls for this to happen (Madan and Evans, 2009). From the perspective of our research model, the fact that different countries and different cultures are experiencing the e-book phenomenon at different speeds and in different ways suggests that there may not be a common supervening social necessity, but that different cultures will have different mixes of factors that could be included in this concept. Indeed, as technologies develop, some countries may be the first to experience a quite different set of circumstances that leads to the widespread adoption of a new technology, as yet uninvented and not even in the ideation stage. We are only at the beginning of a disruptive phase in the authoring, publishing, selling and lending of books and over the next three years we shall be exploring and monitoring the situation in Sweden and continuing to monitor developments world-wide, and especially in small language countries. We cannot expect that the e-book will have reached its evolutionary limits in this period, but we expect to witness exciting developments. My thanks to all members of the research team at the Universities of Borås and Gothenburg who contributed ideas and helpful criticism. An earlier, shorter version of this paper was presented at the International Conference: Publishing–Trends and Contexts, 6-7 December, 2013, 19th Book Fair, Pula, Istria, Croatia. This research was carried out under research grant number 2012-5740 from the Vetenskapsrådet (Swedish Research Council). T.D. Wilson is Professor Emeritus of the University of Sheffield, U.K. and Senior Professor, University of Borås, Sweden. He is also Visiting Professor at the University of Leeds Business School and has also held the position of Profesor Catedratico Convidado in the Faculty of Engineering, University of Porto. He holds a BSc degree in Economics and Sociology from the University of London and a Ph.D. from the University of Sheffield. He has received Honorary Doctorates from the Universities of Gothenburg, Sweden and Murcia, Spain. He is Publisher and Editor in Chief of Information Research. Burke, E. (2012, May 24). Edco’s e-books could make textbooks a thing of the past. Silicon Republic. Retrieved from http://siliconrepublic.com/innovation/item/27399-edcos-e-books-could-make-t [Unable to archive]. Christensen, C.M. (1997). The innovator’s dilemma: when new technologies cause great firms to fail. Boston, MA: Harvard Business School Press. Keeney, G. (2014, January 22). E-book licensing seems to be the new nightmare for academicians/scholars. [Online forum comment]. Retrieved from http://linkd.in/1hNHnrg [Registration necessary]. Williams,T.I. (1957). A history of technology: from the Renaissance to the industrial revolution. Cambridge: Clarendon Press.